Steph Lodge is a writer, competitive weightlifter and nutritional consultant. There’s just nothing better to pair your morning cup of coffee with than a coffee cake. This gluten-free, grain-free, coffee cake recipe is perfect for a Sunday morning brunch, a weekday treat, or even an after-dinner sweet. If you’ve been following a ketogenic diet for a while, you may start missing some of your classic carb-heavy indulgences. That’s why keto recipes like this one come in so huge. You can stay on track with keto, without missing anything from your days of heavy carb consumption. So next time that coffee cake craving comes knocking, you’re covered. By switching out your standard white flour for almond flour, you’re not only keeping your carbs low, but also enhancing your weight loss efforts. Almonds are rich in monounsaturated fat and naturally low in sugar and carbohydrates. Unlike white flour, using almond flour will help keep your blood sugar stable and may lower some markers for metabolic syndrome. Furthermore, research shows that adding almonds to your diet can support weight loss, especially when used in place of complex carbohydrates[*][*]. Among the many beneficial qualities of eggs is their ability to help fuel your body with a robust and steady supply of energy that won’t spike your blood sugar levels. They contain lutein which has been shown to increase productivity and physical activity[*]. One of the primary fats found in almonds is monounsaturated fat. Unlike saturated fats that you find in abundance in the western diet, you get monounsaturated fats from foods like nuts, seeds, olives, and olive oil. One study found that replacing some of the saturated fat in your diet with monounsaturated fat can increase physical activity, along with your resting energy expenditure — i.e. how many calories you burn at rest[*]. The monounsaturated fats found in almonds not only increase physical activity, but they can also support your heart. Research shows that diversifying your fat sources can benefit heart health, with monounsaturated fats potentially helping with weight loss and cardioprotective activity[*]. This cake is not only easy to make, but it’s also incredibly filling and will keep you fueled throughout the morning. It’s perfect for baking on a Sunday evening, and you can even double up the recipe, so you have a grab-and-go breakfast ready all week. Go ahead and gather all of your wet ingredients and dry ingredients, a couple of medium bowls, and preheat your oven to 350 degrees Fahrenheit. With one of your bowls, start by mixing the ground cinnamon and monk fruit until well-combined and set aside. You’ll use this mixture as your filling. For the cake part of this decadent treat, you’ll get another bowl and add your almond flour, sweetener, eggs, butter, and almond milk. Whisk all the goods together until it’s perfectly combined. Get your 9×9 baking dish out, grease it, and pour about half of the batter into the dish. Take the filling that you mixed in the beginning and sprinkle it on top of the mixture then add the remaining batter mix into the dish. Place the dish in the oven and bake it for about 30-35 minutes. While the cake is baking, mix the frosting ingredients and set them aside until your cake is ready! After you’ve finished making the frosting, you can make the optional crumble. Grab a small pan and place it on the stove over medium heat. Lightly toast the almond flour until golden brown, usually taking about 3-4 minutes. Add the toasted almond flour, coconut flour, cinnamon, monk fruit sweetener (or swerve if you have it), finely chopped pecans, butter, and sea salt into a small bowl. Work the mixture together until you have a crumbly texture. Test the cake with a toothpick to make sure it’s done — if it comes out clean, the cake is ready! Once your cake is finished, brush it with a little melted butter, add the frosting, and sprinkle on the optional crumble mix. Looking for a low-carb treat sure to satiate that sweet tooth? 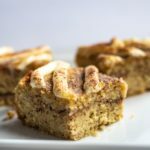 Look no further than this fulfilling cinnamon keto coffee cake with cream cheese frosting. In a small bowl, mix the sweetener and ground cinnamon for the filling and set aside. For the coffee cake, mix the almond flour, sweetener, eggs, butter and almond milk in a large bowl. In a 9×9 baking dish, pour half the batter into the pan, then sprinkle the filling mix on top. Then add the rest of the cake batter to the pan. Bake the cake in the oven for about 35 minutes. While the cake is baking, mix the frosting ingredients and set aside. After you’ve finished making the frosting, you can make the optional crumble. In a small pan over medium heat, lightly toast the almond flour until golden brown, which may take about 3-4 minutes. Once it’s done, take out the baking dish and brush it lightly with a little melted butter, add the frosting, and sprinkle on the optional crumble mixture. These can be made as muffins, too. Just line a muffin tin with liners, evenly pour the mixture into the liners and bake for 20-25 minutes or until you can pierce a muffin with a toothpick and it comes out clean. Then allow the coffee cake muffins to cool, top with the frosting and crumble mixture and enjoy.